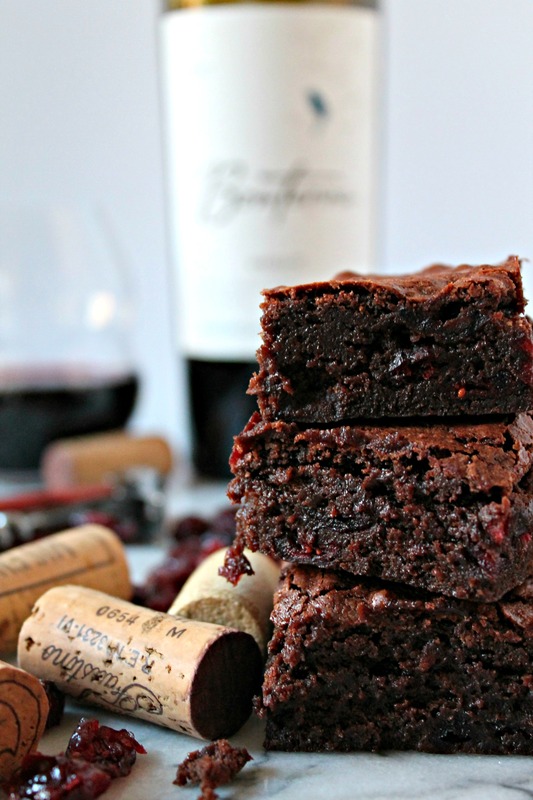 They’ve made their way around the Internet for a couple of months now, so it was about time this brownie lover tried her hand at making Red Wine Brownies. Using my classic brownie recipe, I’ve adapted it – these might just be the best brownies you’ve ever tasted! Let’s just take a moment to admire these red wine brownies – yes, they taste just as good as they look. Yes, they will blow your mind and you’ll panic once you have that first bite, because you’ll fear about eating the entire pan in one day. Personally, I have zero willpower around brownies, so I cut out three squares, individually wrapped them and threw them in the freezer – the rest, I gave away to a friend to enjoy. That’s how addicted I am, I had to get them out of the house. 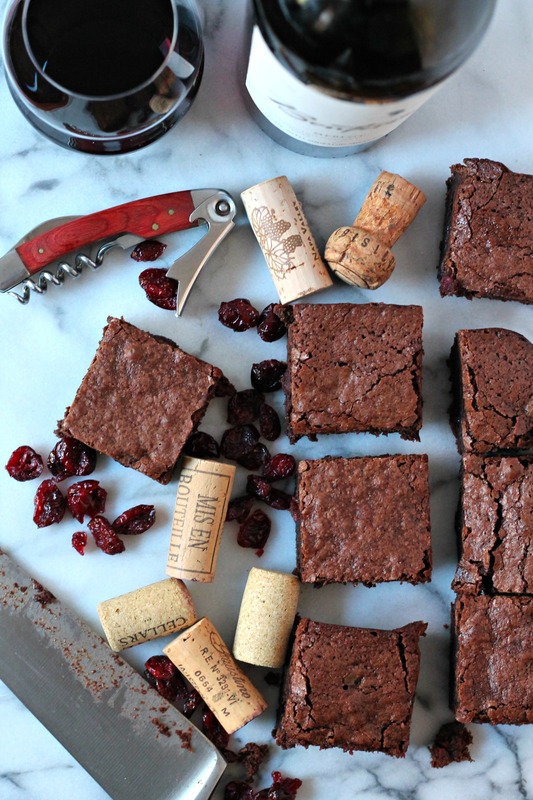 You might be wondering – why add red wine and cranberries to brownies? They’re pretty perfect already, specially if you’ve made my Ultimate Triple Chocolate Brownies. But if you look beyond and see everyone hosting chocolate & wine pairing parties, you’ll understand just how well chocolate and wine go together. This recipe was inspired by (who I think was the original creator of this recipe), A Cookie Named Desire. This brownie recipe uses both milk chocolate chips and cocoa powder, for an intense chocolate flavor, as well as two types of sugar. Granulated sugar adds the sweetness while the dark brown sugar adds that chewiness classic in brownies. The addition of dried cranberries are perfect to break up the chocolate, because when you get a bite of the cranberries, the burst of tart, sweet flavor notes will make you smile. And last but not least, let’s talk about what wines to use in your brownie baking – for this recipe, I used a Merlot for how well it stands up to chocolate. The tasting note of this organic merlot (chosen by the husband) were “aromas of black currant, black cherries and a touch of wood smoke with flavors of plums, dark berries, toasty oak and vanilla spice” and when you read that, you KNOW it’ll be perfect in red wine brownies dotted with dried cranberries. So what are you waiting for? Grab the recipe below and get to baking the best brownies in the world! Get ready for the best brownies you've ever tasted - that's a promise! Preheat the oven to 350F and grease an 8 by 8 inch square pan. In a small saucepan, melt the butter with chocolate chips, cocoa powder, and salt over medium heat. In a large bowl, mix the eggs, sugar, and vanilla extract. Remove melted chocolate/butter mixture from pan and let cool for five minutes. After five minutes, whisk into the sugar and eggs. Add the flour, baking powder, and cranberries until well mixed. Drizzle in the red wine last and just fold in. Scrap batter into pan and bake 35-45 minutes until top is set but middle is still a bit soft. You can scoop and serve immediately but it will be very fudgy. Instead, let sit overnight in the refrigerator and cut into squares to be enjoyed. I am a chocolate fiend and I do love my wine, although being pregnant for almost 8 months has been pure torture, I’ve been a good girl… these brownies did not dissapoint! Literally so soft and cake-like! I only had semi sweet chips and didn’t add the extra half cup of chocolate, but I did use dark cocoa powder. All I can say is this momma has found a new guilty pleasure…. yummy! WOW! Just give me the whole tray and I’ll be on my way, okay? These sound fabulous!